The first thing you noticed about this game was the speech. Gorf had a speech synthesier chip and talked: a lot. A lot of insults were hurled at you, and as you gained ranks, it would speak your rank and change its insults accordingly. It would even laugh when you died! 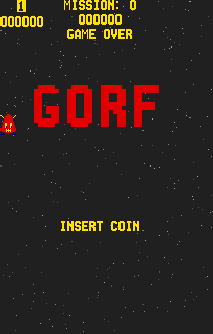 Gorf was one of the first multi-level games, and each stage was a mini-game in its own right. Mission 1: Astro Battles. This mission is a wave of Space Invaders with a twist. Instead of fixed 'shields' that are eroded away as the aliens descend and fire on you, Gorf provides an energy shield that is turned off each time you fire. This prevents you from opening gaps in the shield when you return fire. If the shield is down, i.e. you are firing, the alien shots pass right through without damaging the shield, temporarily leaving you exposed. Each shot you fire also cancels the last shot, so you need to wait until it hits an alien before firing again. Mission 2: Laser Attack. Two Laser Gunships and their Escorts attack your ship. The escorts start in formation, and randomly break off to engage your ship. The Laser Gunships (and their escorts that are not independently attacking) move about and randomly downward toward your ship. The beams are always fired vertically. Mission 3: Galaxians. A wave of Galaxians attack. There are three rows (Yellow, Blue, Red) plus two Galaxian Flagships that break off and attack from the top. Each successive mission will cause more ships to simultaneously break off and attack. The biggest threat is the release of small shots that each ship will fire on its way down screen. Mission 4: Space Warp. 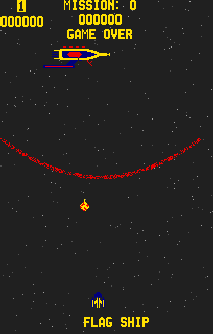 Enemy ships spiral out of a space warp and fire energy mines towards your ship. Some ships spiral out in a very circular pattern. Others emerge in a very erratic elliptical pattern, trying to crash into your ship en route. Mission 5: Flagship. The shielded Gorfian Flagship fires energy mines, while you try to hit the reactor core. If you hit the ship, but miss the reactor, a piece of debris will fly off the ship. These can be shot for points, or avoided, but contact will result in destruction of your ship. Only a direct hit to the opening in the reactor core will destroy the flagship. There is an energy shield above you and you must fire through this to create a route to the flagship. Laser Attack Ship: 100 points. Laser Attack Gunship: 300 points. Blue Galaxians formation atacker: 80 points. Red/Yellow Galaxians formation atacker: 100 points. Galaxians lead ship: 300 points. Space Warp Ships: 100 points. Astro Battles: Pick off the lowest row as the Gorfian Ship is dropping them in place. Move to right ahead of the columns and pick off as many complete columns as possible. Dodge the shots and move back to the left to pick off columns as they move back across the screen. Laser Attack: The escorts tend to be a bigger problem than the Laser Gunships. Try to take out one of the Gunships so you're not trapped between two at once. Then take out the escorts. If you get lucky or finish off the escorts, get the last Gunship. Laser Attack: Special Note : This is the only mission in which it is possible to take a break and rest during long games. Carefully eliminate all escorts and leave one or both Laser Gunships. Move to the far left (or right) side of the screen. 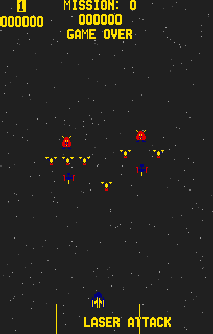 The game always moves the formation of escorts with a Laser Gunship. The program ALWAYS positions the formation as if ALL escorts are intact, even if they have already been destroyed. Due to this assumption, the Laser Gunships will never move all the way to the edge of the screen! Galaxians: Stay out of the corners. Try to pick off a few columns as they form up. Then try to get as many of the ships that attack as possible. Space Warp: Constant movement is the key here. Get as close as possible to the warp. Move from side to side, trying to time your movements with the circular motion of the ships, firing repeatedly. Only break the motion to dodge the energy mines. Some ships will follow a spiral that leads directly to your ship. These ships follow an egg shaped path. Watch for them and be ready to shoot or avoid them. Flagship: Move to the Flagship's shield immediately. Try to remove as much of the shield as possible from the middle or left side. Try to time your shots to hit the missing chunk of the ship under the reactor. It is possible to take it out with one shot. Avoid or shoot any pieces that fly away from the ship.